With Impressions, our driving goal is to bring orthodontic treatment to more people in North Carolina and the U.S.
Impressions provides the comfortable, easy-to-use and virtually invisible advantages of Invisalign at a lower cost and with only one or two check-in appointments. 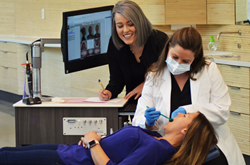 Designed for adults and teens who want the quality of Invisalign in a home-managed form, Impressions offers flexibility and a price about half that of Invisalign or traditional braces. After an initial appointment, Blue Ridge Orthodontic’s team provides a complete set of aligners (up to 25 sets) plus a refinement scan for up to 25 additional aligners, if needed. Patients wear each set of trays for 20 to 22 hours a day for a week, removing the trays to eat, drink, brush and floss. Most people will complete their Impressions treatment within six to nine months. Built on a teledentistry model, more North Carolinians are able to access quality orthodontic care and achieve the smile of their dreams from the comfort of their homes. Even if you live in a county that has a strong orthodontic presence, you may find Impressions is easier and more affordable than the options offered at a traditional practice. That’s because Impressions has revolutionized the clear aligner system. Compared to comprehensive orthodontic treatment with clear aligners, Impressions produces results for half the cost and in half the required time. What makes Impressions different from other at-home orthodontic options? Treatment is managed by a Diamond-level Invisalign provider. Based the proven Invisalign system and manufactured by Invisalign using the best materials in the clear aligner industry. In an effort to make quality orthodontic care even more affordable, Impressions patients can now opt for an extended payment plan. Dr. Luke Roberts developed Impressions because he believes more people should have the opportunity to get the smile of their dreams. After years of running an orthodontic office, he realized that many members of his community in Western North Carolina can not afford traditional forms of treatment. With Impressions, our driving goal is to bring orthodontic treatment to more people in North Carolina and the U.S. For more information about Impressions, visit impressionsmile.com or call 844-846-8836.